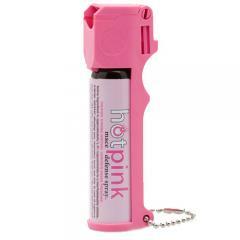 Stay safe on the go while also making a statement in neon color with Mace's Hot Pink Mace Pepper Stream Spray 18 grams. The OC formula in this little package contains 10% pepper heat from a concentration of 1.4% capsaicinoids tinted with UV dye for identification of a perpetrator after the fact. This spray delivers 10-20 bursts in a stream configuration and reaches 8-12 feet so you have multiple chances to retaliate against an attacker from a safe distance. The Mace hot pink model features a flip top cap for your safety as well as a dispenser with a defined grip for your finger which enables you to aim more accurately without fumbling or looking down. Attach your pepper spray device to your belt using the clip or to your key chain so it's always right at your finger tips. Please note that sprays cannot be shipped via air or to a PO Box - shipping is via ground service to street addresses within the continental US only. Quality is good and delivery was speedy.